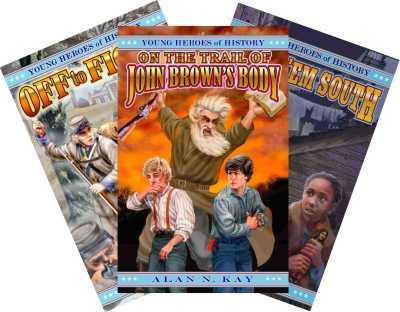 Young Heroes of History books are designed for the middle age reader and can be used in various ways both inside and outside the classroom. Free Lesson plans are already available (and free for the asking) from our website. In addition, the books are easy enough to utilize that individual teachers can draw up their own plans. For further questions and advice on how to teach, feel free to contact the author. As a teacher himself, he has plenty of ideas to share with you. To provide background information on the Civil War as part of the everyday descriptions. To introduce major characters such as General Lee and John Brown and portray them as they appeared to the people of the times. To portray the time period through the eyes of the people who lived it. To portray the events in a non-biased way in order to allow the reader to evaluate and judge. To describe the issues of the times in contemporary terms. To include the everyday concerns of people of the time period in order to put the larger issues into perspective. To portray the individuals as people similar to ourselves that the reader can relate to. To instill an appreciation of history. To provide the reader with questions and issues for debate and discussion. Background knowledge for the teacher. A reading source that the teacher reads to the students. A group of outside assignments with different students reading different books. An interdisciplinary tool between social studies and reading teachers. A major source of study. A class set that is read together. An introduction before a field trip. Please Note: Young Heroes of History books are stand alone stories that can be used at your discretion. Obviously they can also be used as an all encompassing series that can be read in its entirety or you could purchase a special class set that would include smaller amounts of each book that your students could then break up and read separately. They could then report to each other what each book is about and you could make a class activity of putting it all together. Keep in mind however that this option will be limited for the next year or so while the final books are in publication.